Total peripheral vascular resistance which is also known as systemic vascular resistance or an ancient term i.e. total peripheral resistance. In case of resistance in pulmonary systemic circulation, it is known as pulmonary vascular resistance. This condition is described as resistance which is offered by systemic circulation. Vascular resistance is basically a force which opposes blood flow. Blood flow have to overcome this force to create proper flow. This resistance is generated by walls of blood vessels to hinder blood flow. If this systemic resistance increases than usual, then it can cause severe problems related to vital organs of body. Increased total peripheral vascular resistance causes problems in blood flow. If blood is thick or of increased viscosity, the resistance will also increase. In other cases, when vasoconstriction occurs, peripheral vascular resistance increases and let only a small amount of blood to pass at a time. Opposite to this, when vasodilation occurs, the peripheral vascular resistance decreases and blood flow increases. When this systemic vascular resistance increases, it opposes blood flow and as a result high blood pressure occurs which may lead to further complications like heart failure, angina attack or even death. 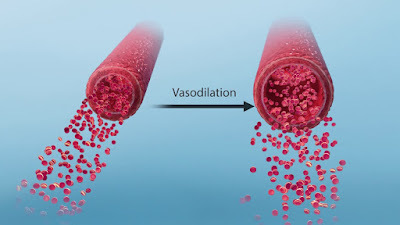 In case of vasodilation, systemic vascular resistance decreases. Likewise when blood is less concentrated i.e. low viscosity, the peripheral vascular resistance automatically decreases. But blood with low viscosity cause turbulence in vascular system. Low peripheral resistance means large amount of blood passes through blood vessels at a time. It may lowers blood pressure and cause complications. Patient may fall down and go faint. Blurred vision and sweating may occur. In that case blood thinning agents are strictly prohibited as these may cause death of patient. When blood vessels dilate, the blood flow decreases and ultimately peripheral vascular resistance also decreases. Decreased resistance means larger blood flow. When blood flow increases, according to this cardiac output decreases. As a result blood pressure decreases and heart rate slows down. Contrary to it, when vasoconstriction occurs (narrowing of blood vessels), the peripheral vascular resistance increases and as a result blood flow decreases. Due to decreased blood flow through vessels, the cardiac output increases and as a result blood pressure increases and heart rate speed up. This is all about relationship of cardiac output with total peripheral vascular resistance. During pregnancy, the cardiac demand increases. Increased cardiac output is observed at initial stage of pregnancy and in third trimester, the cardiac output achieves peak level i.e. about 30 to 50 percent above from baseline. The release of progesterone leads to vasodilation and as a result total peripheral vascular resistance decreases almost 20 percent. This reduction in peripheral vascular resistance leads to increased blood flow. Cardiac output is increased due to estrogen secretion. As estrogen increases preload on heart and increases stroke volume leading to increased cardiac output.